Sheltered. South, west or east facing. 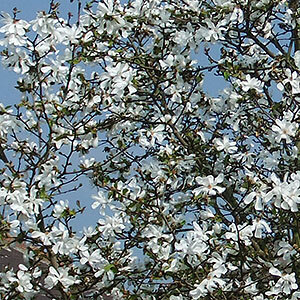 One of the smallest and most popular magnolia trees grown in the UK. Grown for its large, delicate, pure white and lightly scented star shaped flowers, which are born in profusion in spring, before the leaves appear. Slow growing and ideal for small gardens. Habit: Compact. Can be grown as a small tree or shrub. Flowers: White open flowers with strap-shaped petals. Usually open before the leaves appear. April is the best month to plant Magnolia, pick a sheltered spot away from cold winds that avoids early morning sun, as this can damage the delicate flowers if frost has settled on the buds. Do not plant too deeply and add plenty of humus to the soil. Stake young trees for first two seasons, until established and water thoroughly if there is a drought. Pruning is not necessary, except to remove any dead or diseased branches. Add a layer of well rotted compost/humus around the tree each spring. Ideal as a small specimen tree or bush. Perfect for the small garden and can be used as a feature plant in a lawn or border. The best way to propagate Magnolia Stellata is to layer branches in early summer. Cuttings can be taken in summer but are slow to root, so a heated propagator is required.